Tagua (tah-gwah) is a plant alternative to ivory. A large, hard nut that can be cut, shaped and sculpted into. 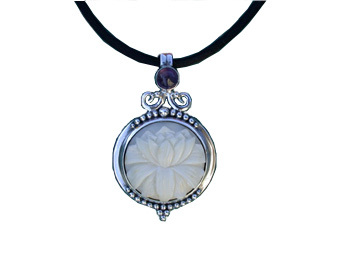 Get this Tagua lotus in a sterling silver fancy pendant. There is an amethyst cab at the top by the O-ring. It has a wider silver bezel with fancy design. It comes with 17.5'' black silk cord with 0.5 in clasp. Designed by Sabine Koehring and made in Indonesia. About 9g in weight and 3cm wide by 5cm high. I received the pendant promptly. It is of very nice quality. I wore it to a special spiritual event and had many compliments.